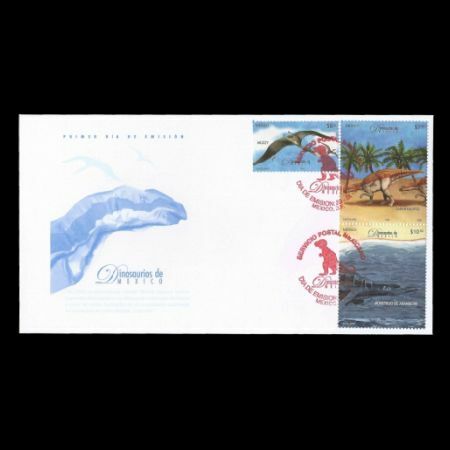 Mexico 2006 "Dinosaurs of Mexico"
On end of September 2006, Mexican Postal Service in cooperation with The Museo del Desierto ( The Desert Museum), presented ,for the enjoyment of philatelists and the general public , a souvenir sheet with 3 stamps of prehistoric creatures which leaved on territory of the country in far geological past: Upper Cretaceous (100 - 60 Mio. years ago ) and Late Jurassic (160 - 145 Mio. years ago ) periods. The history of life on earth is one of the most thrilling topics for the human being, because we intend to comprehend the origin of our own species. Our innate curiosity makes us ask ourselves about the origin of life, about the diversity of organisms known in the present and the ones that existed in the past. Paleontology makes studies about this creatures that lived in a geological past and is the source of information about the history of life. 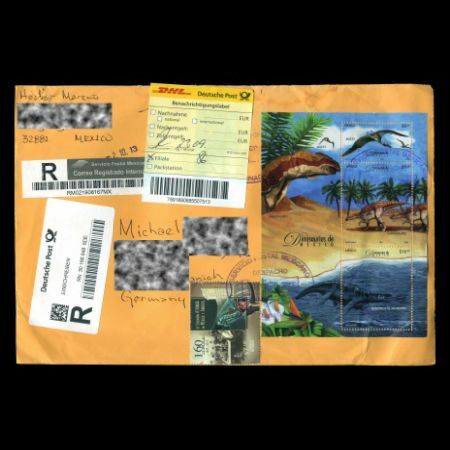 In 1926, the German paleontologist Werner Janensch made the first description of a dinosaur in Mexican soil fossilized remains of a ceratopsid found in the locality of Sierra Mojada, Coahuila. Later on some more dinosaurs bones has been found in Múrquiz municipality.Thereafter, others paleontologists made another findings in the area in the second half of the past century, made Coahuila was well known at paleontologists community, but the real development was in the middle of 80’s, when the formal rescue of the first articulate dinosaur of Mexico to the world was conducted by a group of scientific of National University (Universidad Nacional Autónoma) of México, with the support of a group of teacher from the Secretary of Public Education of Coahuila. 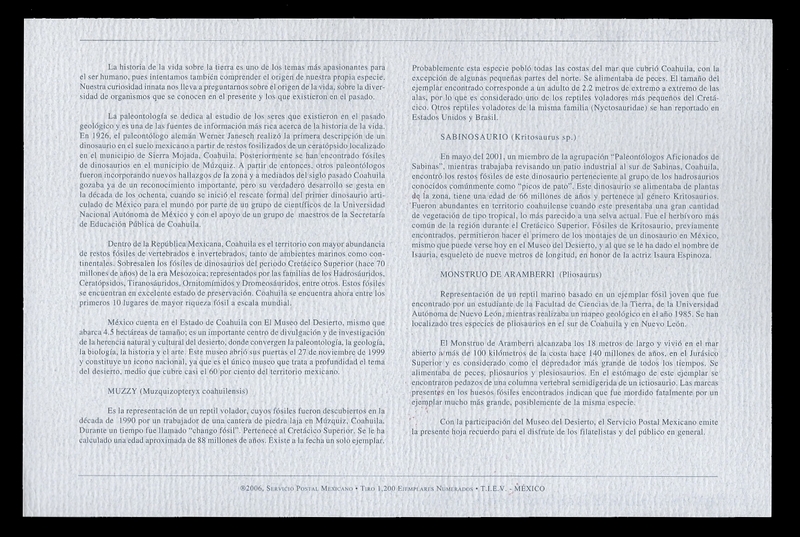 In the Mexican Republic, Coahuila is the territory with the most abundance of vertebrate and invertebrate fossils, both marine and continental enviroments. Most notable are dinosaur fossils of Upper Cretaceous period (70 million years ago) of Mesozoic era; represented families of Hadrosaurs, Ceratopsians, Tyrannosaurids, Ornithomimids and Dromaeosaurids, among others. This fossils are in excelent state of preservation. Coahuila is in the top 10 of places of major fossil richness around the world. In the state of Coahuila we find the Desert Museum ( El Museo del Desierto) wich occupy an area of 4,5 hectares (45000 square meters; it is a very important site of divulgation and research of the natural and cultural heredity of the desert, where the paleontology, geology, biology, history and art converge. This museum opened its doors on November 27, 1999 and is a nacional icon, due to the fact that it´s the only museum that deeply investigate the subject of the desert which covers almost 60% of the national territory. 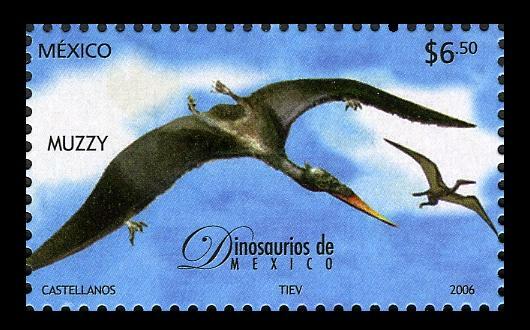 is the representation of the flying reptil from Upper Cretaceous, it's age has been calculated in 88 million years, whose remains were discovered in the 90’s decade by a worker of a flagstone quarry in Múzquiz, Coahuila. For a while it was called “chango fósil” (chango means boy). Only one speciment is found to date, this species maybe populated all the shores of the sea that covered Coahuila with the exception of some parts to the north. The size of the adult specimen is about 2,2 meters of wingspan, so its considered a small reptil of Cretaceous period, whose ate fishes. Other flying reptiles from the same family (Nyctosauridae sp.) are discoverd in USA and Brazil. ON May 2001, a member of the group "Amateur Paleontologists of Sabinas" (“Paleontólogos Aficionados de Sabinas”), found the fossil remains of this dinosaur that belongs to the hadrosaurs group commonly known as "duck bills", while he was working on industrial ground south from Sabinas, Coahuila. This is herbivorous dinosaur ( ate plants only) from the area, it age is 66 million years old and it belons to the Kritosaurid genera. They were abundant in the coahuilan territory when it had a great quantity of tropical type vegetation, which was very similar to a tropical rainforest of today. It was the most common herbivorous in the region during the Upper Cretaceous period of time. 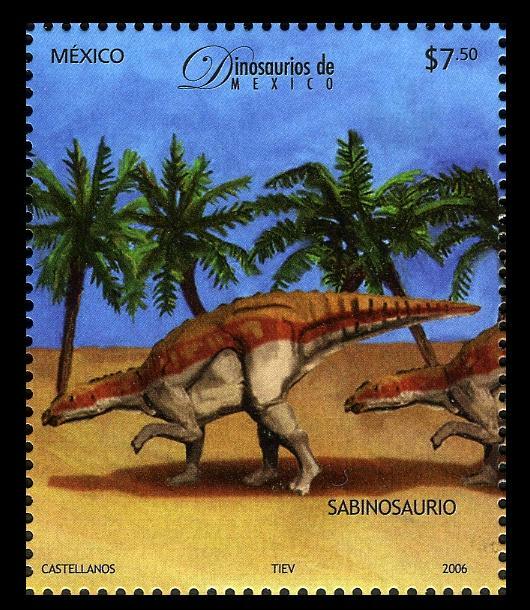 Fossils of Kritosaur allowed for the first mounted dinosaur ever in Mexico which can be seen at the Museo del Desierto and which has been given the name of Isauria, it is a 9 meter long skeleton honouring the actress Isaura Espinoza. 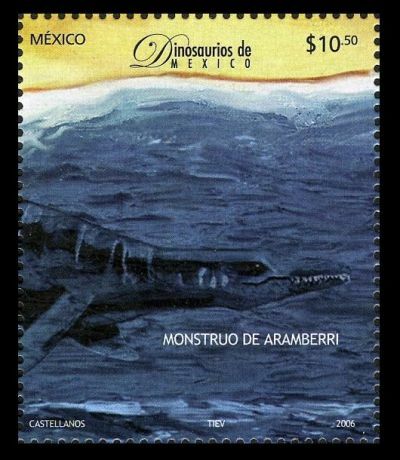 Is the representation of a marine reptile based on a young fossil specimen found by a student of the Sciences of the Earth Faculty from the Autonomous University of Nuevo León, while he was doing a geological mapping in the year 1985. There are 3 pliosaur species have been found in the south of Coahuila and in Nuevo León. The Arammerri Monster reaches 18 meters in length and lived in the open sea more than 100 kilometres from the cost 140 million years ago in the Upper Jurassic and it is considered the biggest predator of all times. They ate fishes, pliosaurus and plesiosaurus. Some pieces of a half-digested backbone that belongs to an ictiosaurus has been found in the stomach of this specimen. Some marks, present on the fossil bones, indicate that it was fatally wounded by a much larger specimen, possibly from the same species. 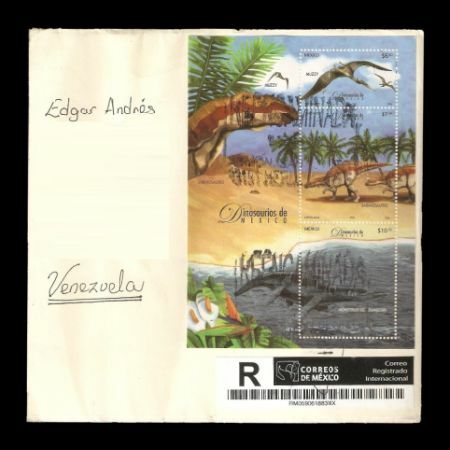 Stamps set Name. 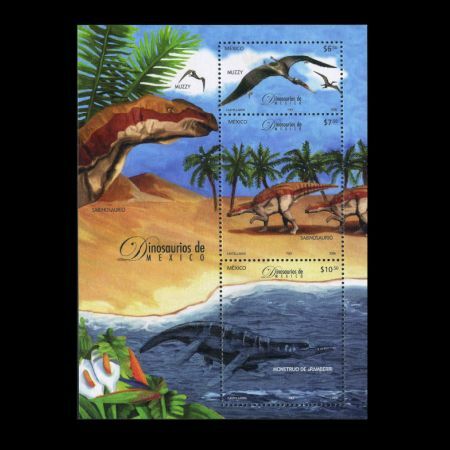 Actually there are only one Dinosaur depicted on these stamps, two other animals arf not dinosaurs, but Pterosaur and Pliosaurus (flying and marine reptilies). More correct name of the set should be either "Prehistoric reptilies of Mexico" or "Prehistoric Monsters from Mexico" rather than "Dinosaurs of Mexico"
Werner Ernst Martin Janensch (11 November 1878 - 20 October 1969) was a German paleontologist and geologist, who is most famous contributions stemmed from the expedition he led with Edwin Hennig to the Tendaguru Beds in what is now Tanzania. The Museum fuer Naturkunde Berlin excavated at Tendaguru hill and in the surroundings for four years, from 1909 through 1911, when Werner Janensch was an expedition leader. 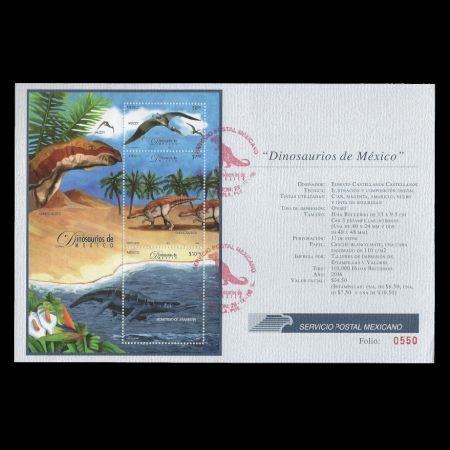 Many excavated fossils of dinosaurs ( include Brachiosaurus brancai, 14 meter high the bigest dinosaur skeleton of the world, shown on German stamp from 2010 ) from the Tendaguru Beds are moved to Germany and can be seen in the the Museum fuer Naturkunde Berlin.